MORE COOKING VIDEOS ON OUR BLOG! 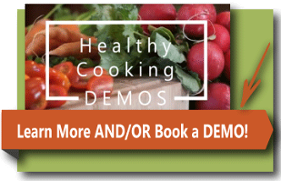 Interested in learning how you can prepare dishes ahead of time to eat healthy during the week? Save time and save money. Watch Chef Paul and get some great tips!! Be the star of any holiday party with these little gems! These appetizers have a ton of flavor but we turn it up notch by adding ingredients like dates, nuts and apples that have lots of fiber and protein filling you up much quicker than starchy snacks. Download the recipes above. Enjoy! In this healthy cooking video, Chef Paul shares a yummy dessert recipe just in time for the holidays. These individual pumpkin pie cheesecakes are delicious, easy to make and have less fat and calories then a slice of pumpkin pie. Please feel free to download the full recipe above. Enjoy! In this video Ulliance Chef Paul shows you how to create two different types of BBQ sliders, one with Jackfruit and one with pulled chicken. These recipes allow you to provide both a meat slider and vegetarian slider at your next tailgating event. You can hardly tell them apart — and they are both delicious! You can also download the full recipe above. Enjoy! Learn how to make Pho at home with a recipe from Chef Paul Penney. that you can leave in your slow cooker during the day. using cream cheese instead of sour cream.